A decade after the rise of e-commerce, today’s mobile technologies and social media applications have contributed to a convergence of consumer demand and technology. Consumers now expect constant connectivity and interactivity from retail brands and retailers must embrace omni-channel retailing, an integrated sales experience that melds the advantages of physical stores with the information-rich experience of online shopping. Omni-channel means seeing things from a consumer’s point of view, not from the comfort of your own business boundaries. It means interacting with customers via their three channels of exploration: social, mobile and local, at every stage of the purchasing process. No longer a one-way street, retailers must let the customer help create the conversation and develop their brand. Social media can create an influential marketing channel, build brand goodwill and provide an insight into the ‘voice of the customer’. Cosmetic retailer Sephora is one example of a company that has successfully created its own interactive shopping social space through the launch of its online Beauty Talk community. Not only is the brand facilitating this discussion – putting themselves at the heart of the community – but Beauty Talk is driving their customers to buy more. Sephora has created a social community where they do not push their products at their customers; instead customer discussions not only fuel authentic peer-to-peer recommendations, but drive increased basket size and value. Apps like ShopSavvy and RedLaser allow the new connected consumer to browse products in physical stores while reading reviews and making purchases (if prices are lower) on their mobile devices. Some retailers are starting to address the potential impact of mobile-phone use whilst in-store and are turning it into their advantage. For example, Overstock.com plans to include extensive consumer-generated product reviews and buying guides on their new o.info domain, acknowledging the customer trend toward trusting other buyers more than advertisers and brand messaging. Developing creative and engaging personalised technology for use in conjunction with tech-savvy sales staff in stores helps to reduce the likelihood of consumers turning to competitors. Neiman Marcus in the US is currently testing an iPhone app designed for this purpose in four of its stores. The app has two parallel interfaces for customers and sales staff, providing consumers with alerts of upcoming events, new product arrivals, QR code scanning, and the ability to learn which of their favourite associates are in the store. Simultaneously, in-store sensors alert staff when customers enter the store, and provide a purchase history (and even a Facebook picture for easy recognition) to ensure that they offer a faultless service. Innovations that personalise the shopping experience keep customers from turning to competitors along the purchasing continuum. In-store technology that enables consumers to interact with products will create unique shopping experiences which encourage customers to shop while fostering brand loyalty. For instance, shoppers frustrated by the lack of standard clothes sizing will soon benefit from Me-Ality walk-in body-scanning stations, developed by Canadian firm, Unique Solutions Design. 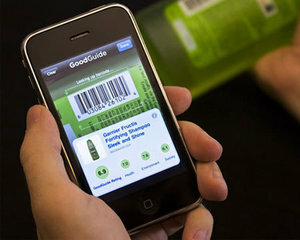 Now implemented in some retail outlets in the US, the scanning technology is used to generate a unique bar code containing the shopper’s detailed measurement data and a customised shopping guide. The technology aims to transform the in-store shopping experience for consumers, creating a unique list of product recommendations. Personalised emails, recommendations and promotions allow retailers to maximise every opportunity to communicate with customers and relevant ads enhance the customer’s overall online experience. Retailers are starting to combine the social and the local to personalise the shopping experience on mobile, allowing customers to interact with local e-commerce ‘landscapes’. For example, Foursquare melds social interaction (friends’ locations) with commercial discounts and promotions from neighbourhood merchants to reach their customers and visitors. Lastly, and increasingly importantly, mobile enables allpersonalisation elements (both on-site and in-store) and delivers them to customers who are on the run orrelaxing at home. When considered as a continuum, personalisation can help deliver on consumers’ increasingly higher expectations of an interactive shopping experience, while helping retailers to raise performance and maximise ROI. Over the last few years, several UK retailers have begun to target overseas markets, with some success. For example, overseas sales made up 67% of ASOS sales in Q1 2012, contributing to a 31% growth in overall sales. FusePump recently published a white paper on the advantages of cross-border sales using online marketplaces such as eBay and Amazon. I’ve been asking FusePump’s George Besly about why cross-border marketplace sales should now be a serious consideration for e-commerce retailers in the UK. Stats include Topshop’s performance on social networks, Olympic social media buzz, SMS marketing, iPhone e-commerce traffic and good news for Facebook stores.